A new tool, Content Chimera, is coming later this year. David Hobbs Consulting is already using this tool for clients with global digital presences. We are currently readying the tool for wider release. Need help sooner? Contact us for an engagement. When making major content transformations, we need to make big picture decisions like what are we going to do with the content and who is going to do that. Content Chimera has a rules engine to allow you to make broad decisions (rather than line-by-line spreadsheet analysis) and see their implications. Content Chimera can both import and export spreadsheets, but in Content Chimera you are usually looking at graphs and rules to facilitate exploration and decision-making. 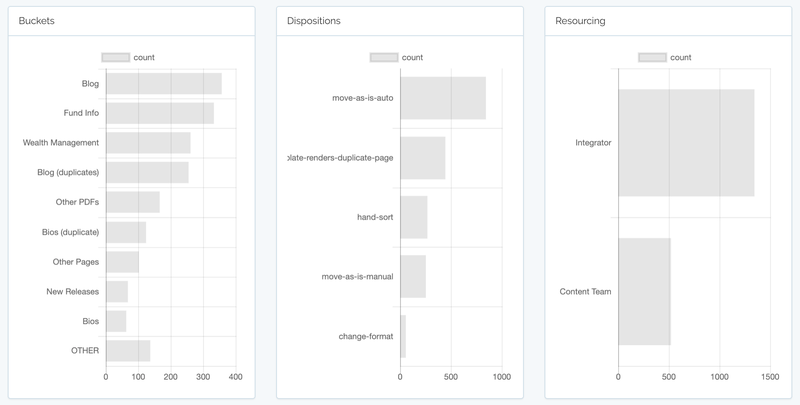 Content Chimera allows interactive visualizations, not just canned reports. Furthermore, as you explore your data you may realize you don't have all the data you need. You can add data about your content from any source via CSV import (or by scraping off Content Chimera's cache of your site). Leadership wants to see the big picture. You may need to understand the content on your site in depth, but that isn't leadership's job. 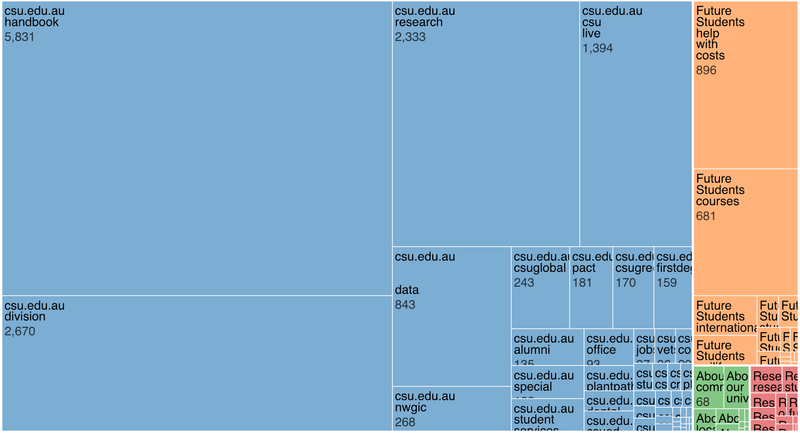 The treemap view in particular can give a broad view of your digital presence at a glance (the example here is across four sites) in order to engage with leadership at a level relevant to them. Content Chimera is optimized for making content decisions at scale. Below are some key features. Rather than do a line-by-line analysis of URLs, Content Chimera has a rules engine that allows you to assign rules en masse. Content Chimera is built for big sites and large suites of sites. Although it stores information on all your content, in charting you can randomly sample examples. Getting a long list of URLs isn't that helpful if large swaths of the URLs are really for the same content (for instance with session IDs in URLs). Content Chimera deduplicates URLs. Using the rules that you define, Content Chimera assigns content to: bucket of content (similar content), disposition (how it will be treated), and resourcing (who will do it). Content Chimera makes no attempt to declare up front what metadata is important for any site. Instead, you can merge in data that you need for your analysis from any source. At any time you can export your content manifest, which is a line-by-line spreadsheet of the content, the assignments, and metadata. Not only is Content Chimera designed for large digital presences, it is designed for a single organization to have multiple clients (each with its own sites). Content Chimera is built for complex, global digital presences. Not only can you analyze a lot of sites individually, but you can analysis groups of sites or an entire organization's presence. Content Chimera has a wide range of patterns built in that it can scrape of its cache of your site, but you can also scrape off arbitrary patterns as well. If you are analyzing dates, Content Chimera will automatically "bin" into histogram bars if you have too much to usefully chart one by one. You probably want to start with the big picture, so charting by default only shows the biggest grouping of any data you chart, creating an "other" for the rest. Content Chimera automatically derives metadata from your content to aid in your analysis, such as "folders" in URLs and grouping into file groups. Many tools that people use to understand their content are basically crawlers that generate spreadsheets of a static set of fields. Although Content Chimera can consume content from any data source for your analysis, the most straightfoward way is almost always its industrial-strength crawler. One thing that is very challenging to see in crawlers is how well the crawl is actually proceeding. For that we've built in a variety of mechanisms of tracking the progress (and the ability to start and restart crawls). Content Chimera is already being actively used for David Hobbs Consulting clients (contact us if you'd like to set up an engagement or if you have questions). We are currently working toward releasing the tool more broadly sometime this year. If you sign up below we will send you more information, ongoing updates, and let you know when early access to the tool is available.